Abutilon are free-flowering plants with leaves like maple trees and colorful flowers that have the look of crepe paper. 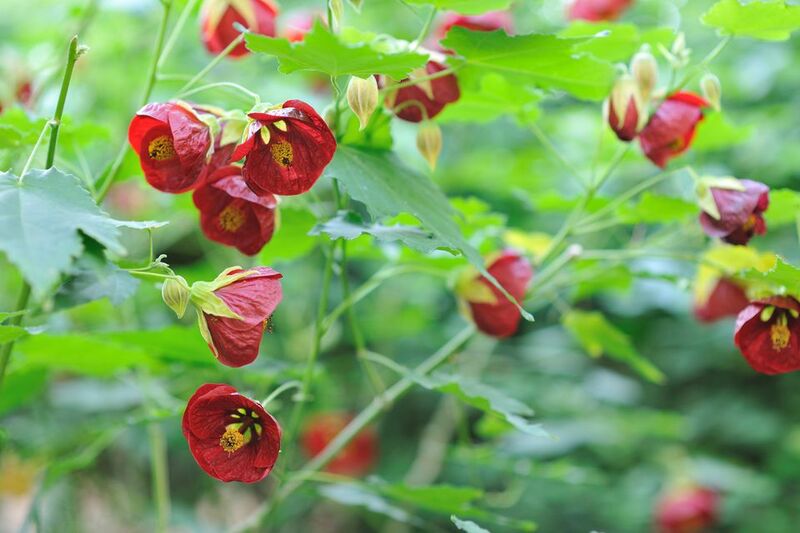 Although Abutilon is no relation to the maple tree, it is frequently referred to as the "flowering maple". Abutilon does have maple-like palmate leaves. You may also notice a similarity to mallows and hibiscus. These are cousins of Abutilon, and in addition to similar flower shapes, they share the ability to produce dozens of flowers. In fact, a happy Abutilon can flower almost non-stop, in shades from white to pale yellow to deep coral and red. Growth Habit: Abutilon are small, upright shrubs with arching branches that bend under the weight of all the flowers. Foliage: The leaves are palmate and can be deeply lobed and/or serrated. Flowers: Most have flowers that start off cup-shaped and eventually unfurl to almost flat, with a downward drooping habit. Some hybrids have smaller flowers with more of a trumpet shape. These seem to bloom the longest of the varieties. Abutilon is only reliably perennial in USDA Zones 9 - 11, however, it is often grown as a houseplant and taken outdoors for the summer. The mature size of your flowering maple depends on the variety being grown. In the ground, Abutilons can reach 8 ft. tall and wide. They tend to be much smaller when grown as potted plants and can be pruned to keep them whatever size you like. For the most prolonged flowering, site your flowering maple in full sun to partial shade. All Abutilon plants repeat bloom. They can bloom continually if given warm temperatures and lots of sun. Since Abutilon is often grown in containers, it is usually a specimen plant. However, outdoors the rich colors blend especially well with saturated blues and purples, like salvia and clematis. Because of Abutilon’s arching habit, it’s a nice choice for an entryway arbor. They can even be trained as espaliers, along fences and walls or as a standard, when grown in a container. Many varieties also do well as hanging plants. Flowering maples aren’t too particular about soil, but they will react to weather and water extremes. They do not do well with prolonged dry periods, but they also don’t want to sit in wet soil. The soil pH should be in the neutral range, but more importantly, it needs to be well-draining. Re-pot container Abutilon’s every year or two and change the potting soil. Propagating: Propagate by cuttings. Snip about a 4-inch tip of a branch while the branch is still green and somewhat tender. Leave 3 leaves, and cut off excess leaves and any flowers or buds. Feeding: Abutilon can be heavy feeders, probably because they do so much blooming. This is especially true when they are grown in containers. Feeding every other week with a dilute, water-soluble fertilizer will keep them blooming. Pruning: Abutilon takes pruning well. Tip prune young plants, to spur new growth and get a fuller shape. If yours starts to become tall and gangly, snipping it back to a leaf joint will encourage it to send out new branches. Abutilon can also be pruned back hard in the spring if you want to control its size. Insects: The usual houseplant pests will affect Abutilon, including whiteflies, spider mites, scale and mealybugs. Scout for problems while watering. Diseases: Diseases affecting Abutilon include: root rot, rust, Alternaria and Cercospora leaf spot. These can be controlled by providing good air circulation, keeping the leaves dry, and using a fungicide, if necessary. There is also Abutilon mosaic virus, but the leaf discoloration or variegation is usually considered a feature.